Laundry room decorating is about functionality, creating convenient storage spaces, good organization, light color schemes and meaningful, very personal and attractive accents. 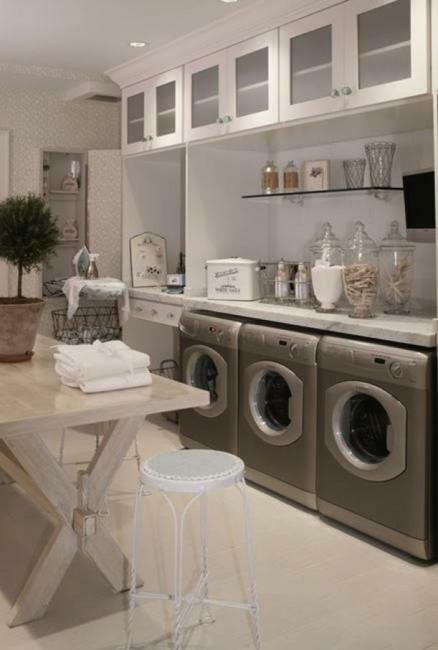 Beautiful laundry rooms are functional and bright, comfortable and inviting. Even small rooms or small areas in mudrooms can look elegantly stylish and comfortable. Here is a collection of beautiful, contemporary and traditional laundry room decoration ideas that are practical, attractive and inspiring. 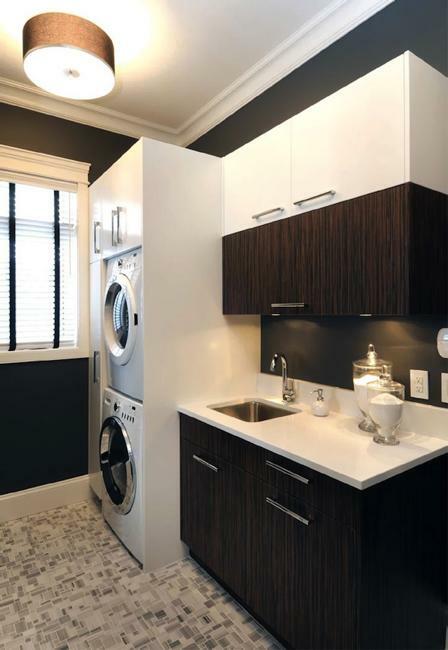 Modern laundry room design calls for an efficient washer and dryer set, simple storage cabinets or open shelves. Floor and wall tiles are great timelessly elegant and practical materials for creating functional, easy to clean and modern interiors. 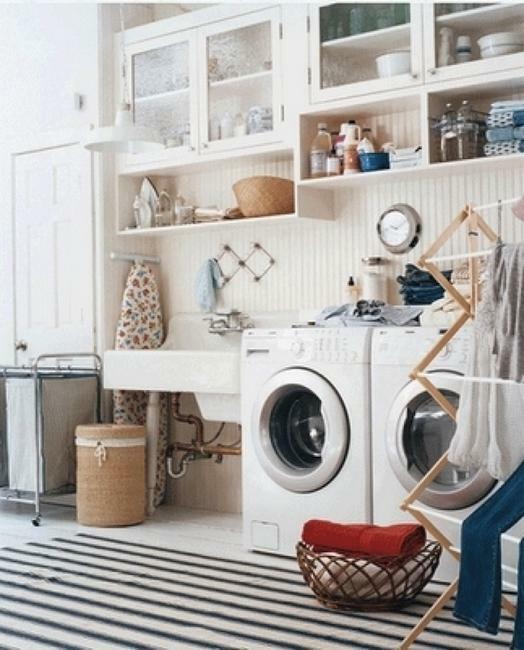 Decorating a laundry room can be impressive and expensive if you have extra money to spend or effortless and elegant on your small budget. 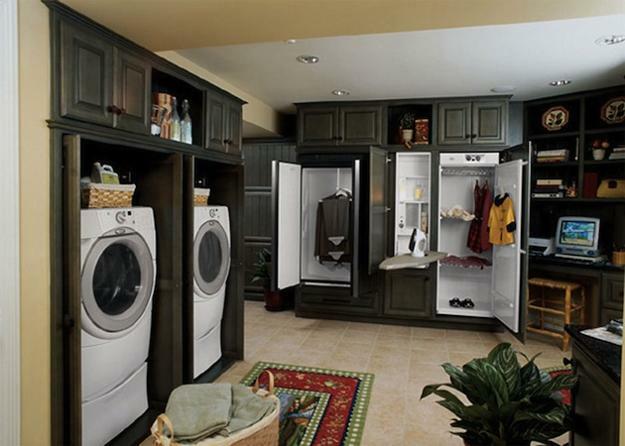 There are many beautiful laundry room design ideas for all large and small rooms. You can select the best ideas for your home, which reflects your taste and lifestyle. The task is creating a functional, easy to clean and well-organized place. 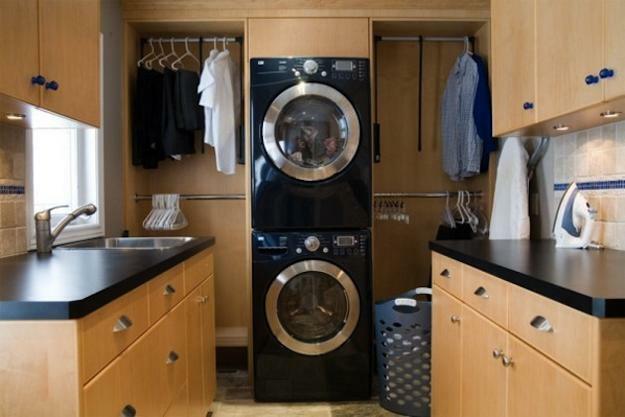 Modern laundry rooms have plenty of storage. 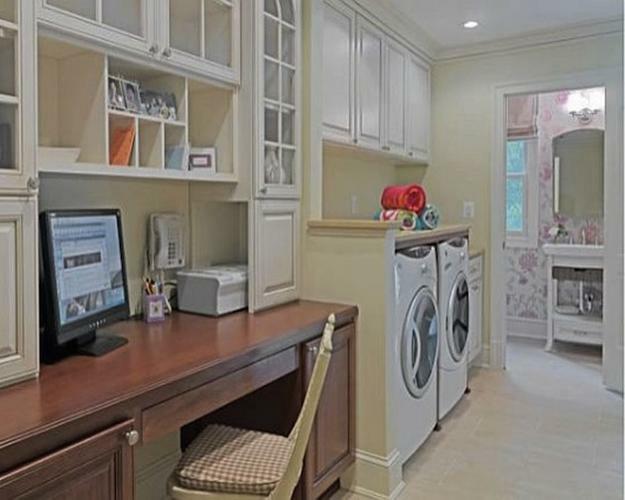 Convenient surfaces for ironing and folding clothes, modern lighting fixtures, and home appliances improve laundry room design, brighten up your space and make all of the tasks enjoyable. 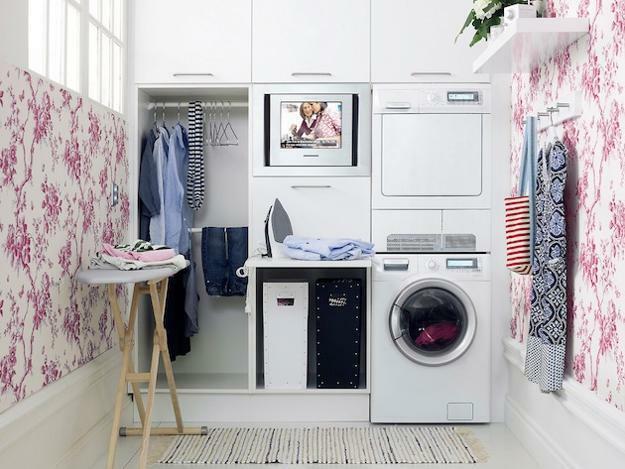 People spend up to seven hours a week in their laundry rooms, so these small interiors should be inviting, comfortable and pleasant to visit. Here are great laundry room design ideas, decorating inspirations and organizing tips for improving your home and creating a functional, simple and beautiful small room for doing laundry, ironing and folding washed items. 1. 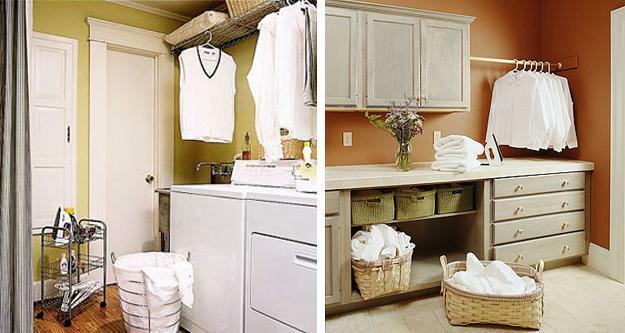 Improve your laundry room design layout. 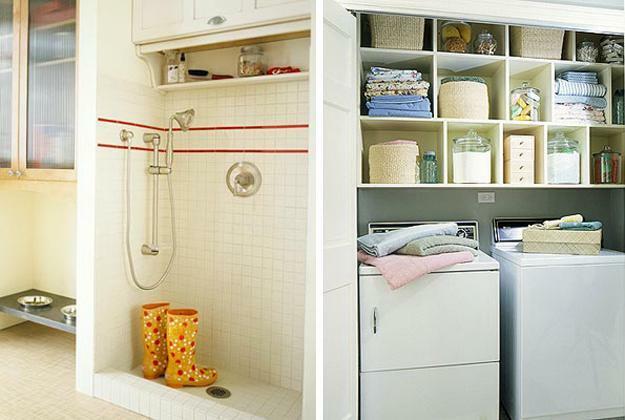 Combine your small laundry room with the adjacent bathroom or powder room. 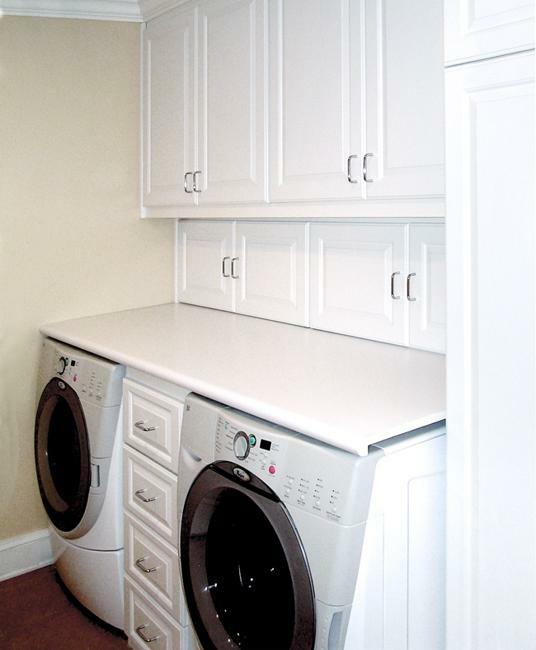 Removing a wall can make your laundry room more spacious, functional and attractive. A wall partition can create privacy for the bathroom area while serving as a shelf for folded laundry. 2. 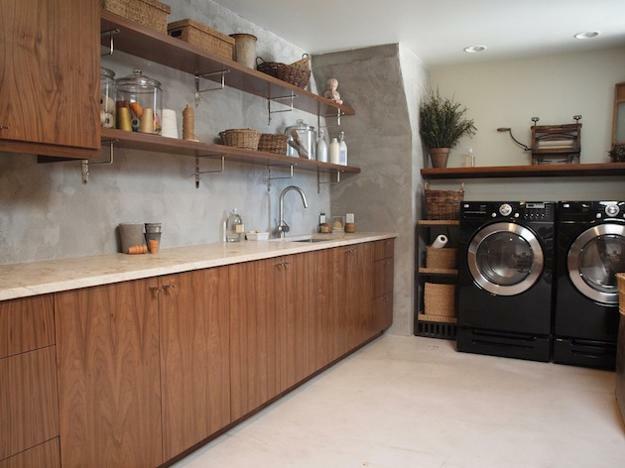 Consider adding contemporary appliances to your laundry room. 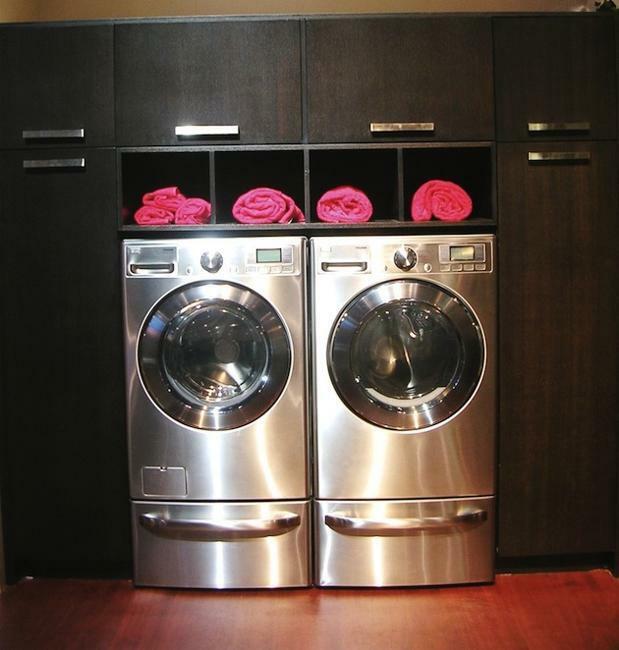 Modern washers and dryers save energy, water, and time while improving the entire look of your laundry room design. 3. 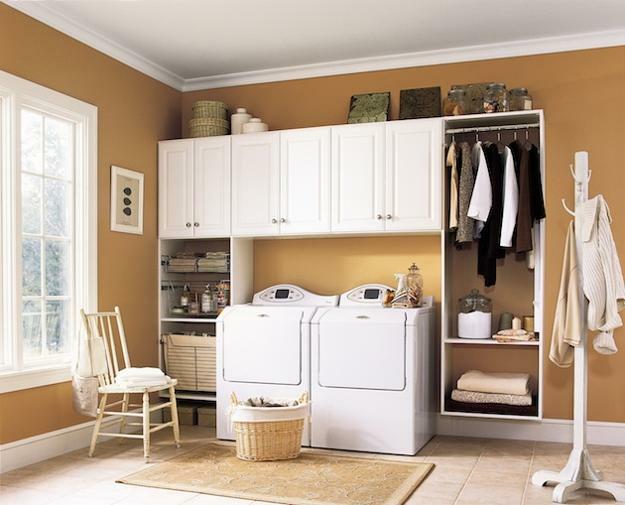 Laundry room designs with open shelves or storage cabinets look differently. Floor-to-ceiling wall cabinets add a modern vibe to a laundry room while open shelves create relaxing and simple interior design, ideal for small spaces. 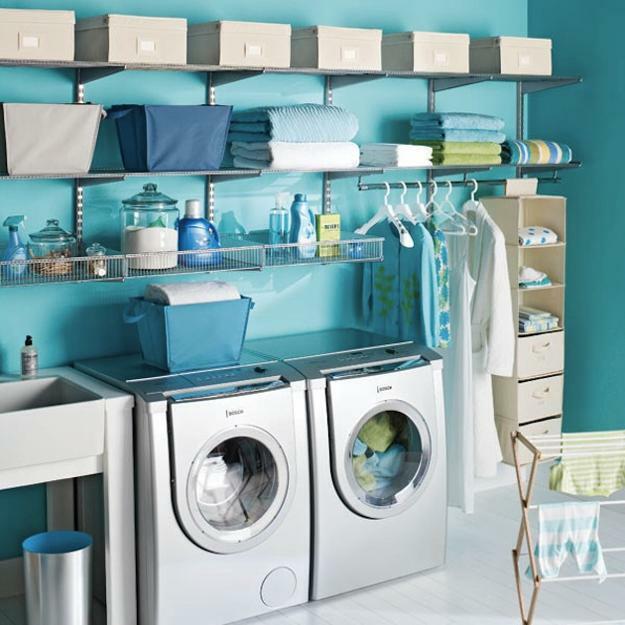 Laundry rooms need to be neat and organized. Hang small garage racks, use hooks and baskets on shelves to keep clutter out of the way and contribute to good laundry room organization. 4. Your laundry room decoration ideas and color scheme may reflect your home style creating harmony with all your home interiors. Rich or pale natural tones and light neutral colors, combined with bright accents are excellent laundry room decoration ideas. Colorful wallpapers, crafts, vintage accessories, towels and attractive containers are great ways to brighten up interior design, add a modern pattern and color to your laundry room design. 5. Efficient, energy saving lighting adds brightness to interior design and improves its functionality. Modern lighting fixtures save your money on electricity and bring more comfort into rooms. 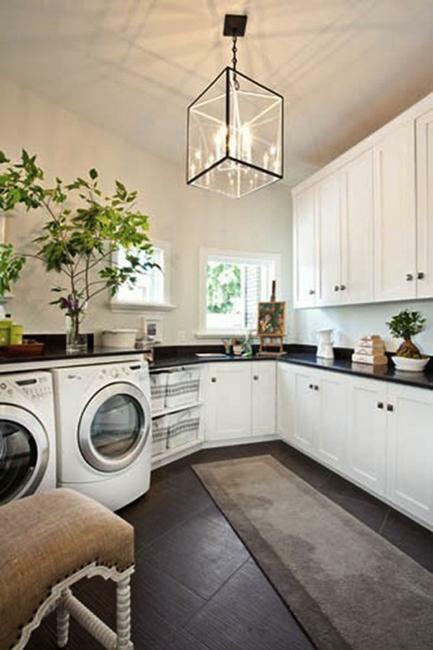 Indoor lighting fixtures and outdoor lights are perfect for laundry room design. Outdoor lights can spruce up your small room and give it a modern, very personal and fresh look. 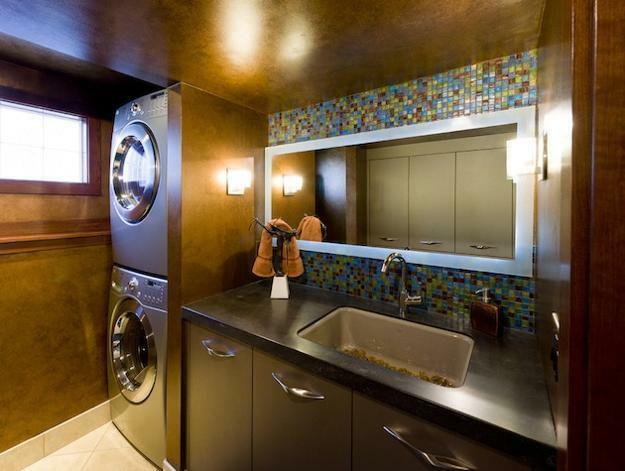 Laundry room decoration with lights, glass and metal accessories contributes to contemporary feel and bright look. 6. Light ceramic and glass tile designs are a stylish and practical idea for laundry room decoration. They stand up to high traffic and look beautiful for years. Easy to clean tiles in light colors visually increase small spaces and add a stylish feel to laundry room designs. Leftover floor or wall tiles can be used to create attractive accents. Sink countertops and backsplash designs look fantastic with tiled walls and floors. 7. Use plastic panels or corrugated aluminum sheets to hide unappealing unfinished walls or a water heater leaving some openings to allow air circulation. Modern synthetic materials in light colors and shiny aluminum work well with home appliances and simple storage cabinets or wall shelves. 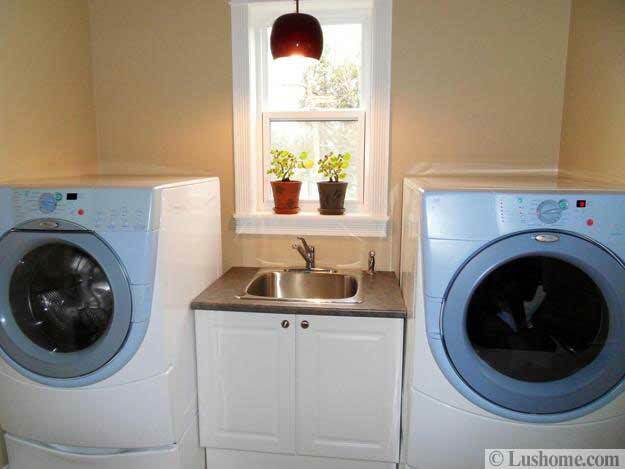 Chrome finish, a window or a modern lighting fixture help create bright laundry room designs. A polished steel trash can and other metal accents can enhance the light and comfortable environment. 8. 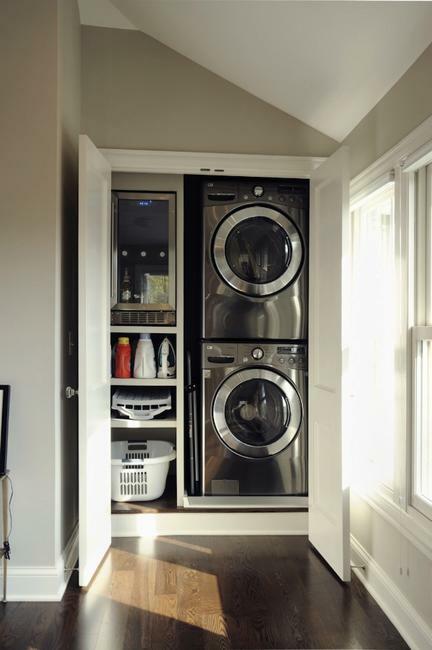 A new floor and freshly painted walls change laundry rooms dramatically. Paint walls your favorite color to enjoy the quick and beautiful result. 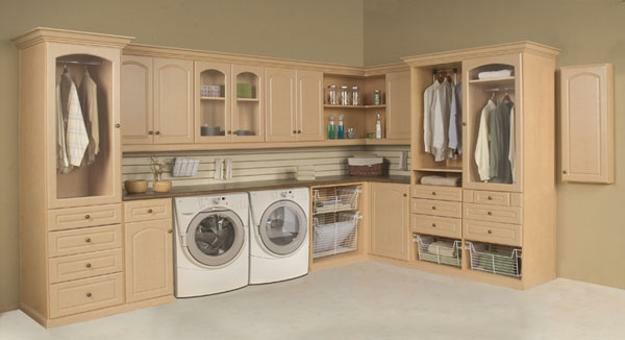 Small rooms benefit from light color choices, but spacious laundry rooms can be in any color. 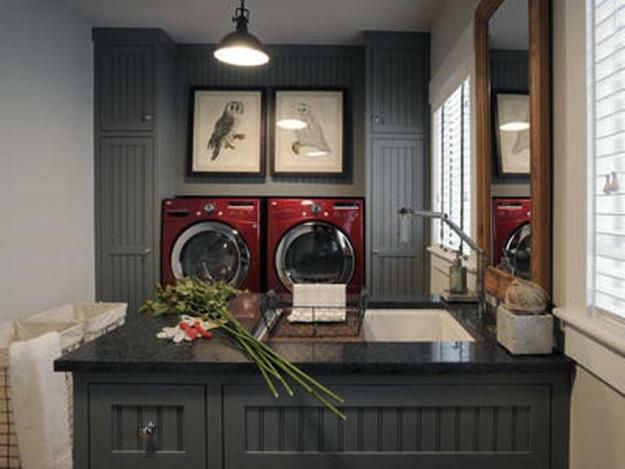 Paint transforms the space, brings freshness into interiors and dramatically improve laundry room design. 9. Install a hideaway ironing board. When space is an issue, think about smart space saving ideas like including a wall-mounted ironing board. You can even paint it to match the laundry room colors. Also, you can add a movable folding table with storage shelves and casters to improve your laundry room design. 10. Adding small decorations, indoor plants, crafts, antiques or retro-modern accessories to your laundry room are great ideas also. 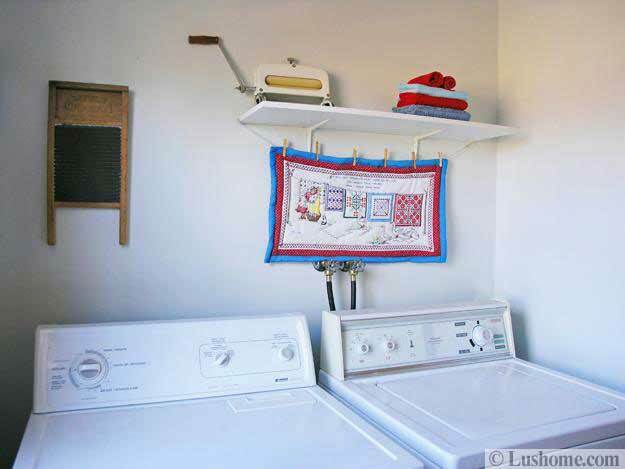 Unique accessories personalize the interior and add interest to your laundry room decoration. Window decorations, light fabrics, and modern window treatments are great ideas for comfortable and appealing interior design. 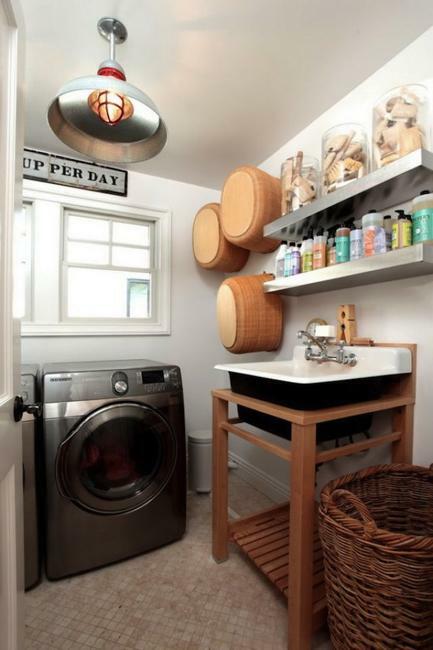 Use outdoor fabrics for your laundry room decoration to create beautiful and functional space.